Born in Cagliari in 1942. After completing her humanistic studies she graduated in Political Science. She continued her studies at university as a lecturer on the History of the treaties and international politics at the University of Cagliari, where she published a book on the problem of neutrality in the foreign policy of Belgium between the two World Wars. She has always been a keen painter, focusing on the study of portraits. In 1983 she abandoned teaching and historic research to dedicate herself to painting. 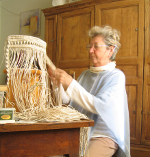 For about 10 years, after casually "bumping into" macramé, and studying the technique in detail, she succeeded in creating objects in macramé with a modern twist; both home furnishings and jewellery items with more contemporary lines and shapes. For her creations she uses materials which are considered "poor" yet of excellent quality, all made in Italy or rather Tuscany: string in linen and cotton. She has a penchant for home furnishings, necklaces and costume jewellery in general, as well as some items of clothing (such as belts). She lives with her family in an old farmhouse in the agricultural area close to Vinci, at 19, via del Fondaccio. Shop and workshop in Pienza (SI), 4 Giglio street.